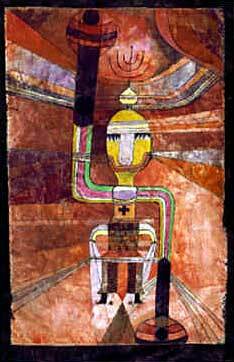 Paul Klee's "The Great Emperor Armed for Battle" ... (great). ith shows by Portland-born Heidi Cody and M.K. Guth, New Yorker Su-en Wong, and Las Vegan Tim Bavington, we had some pretty good art in January  normally a dead month. 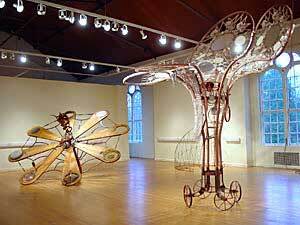 Local David Eckard also pulled off an impressive large-scale show, "Tournament (Lumens)," at the Art Gym. I'm behind anyone with balls like Eckard, especially when they stretch out and grow. All five were pretty good, but none great. Great is rare. For instance, Paul Klee's "The Great Emperor Armed for Battle" still lives up to its name and exists to mock both Bush and Saddam long after the artist's death, while even the PaineWebber show only had three or four great things. For some ideologues, the existence of Great Art has been discredited in the way some insisted the world was flat; the idea of dimensionality went against some established professional epistemology. True to this model, professional associations or bureaurocracies like the "international art circuit" tend to organize around fairly bland or gutless flat-earth, relativist/leveling mandates. Benjamin Disraeli called such things "arch mediocrities." Still, there are exceptions. But they're as rare as Great Art. David Eckard's "Tournament (Lumens)" ... (good). Of course, if you're a professional art ideologue, your shields are already up and you're muttering something about "this argument again!" Ever wonder why it never goes away? It bears repeating: Since topography implies change, and change threatens orthodox epistemology, many contemporary art curators actually prefer "good" to "great" and "a quality" to a statement. Let's remember, most of Western civilization's best art did not need a curator. In short, I prefer highly subjective categorization that leaves room both for stupidity and greatness. Funny enough, snobbery is underrated! Thomas Hirschhorn's "Precarious Construction" (detail): a favorite of the international art circuit ... (good). Many art theoreticians believe their own rhetoric and tend to be apologists for the lukewarm kinda-interesting art that appeals to those elites whose existential situation has never really forced them to make life-and-death choices (see the previous two Documentas or most of the last Venice Biennale). In fact, the constant failure of the Whitney Biennial is what makes it popular. Aesthetes cannot really stand something that is humbling and, like a Greek tragedy, they prefer watching a failure unfold. For that reason, biennials are almost impossible for a curator to do right (last month I mentioned the 1999 Oregon Biennial, but that one kinda sucked, too ... just a few high points). However, someone has to take the fall and I am sooo looking forward to Bruce Guenther getting that periodic whipping-boy spotlight that gets passed around the city. Funny thing is, he'll likely be castigated even more if it rocks. Such is life; if a group show is lauded by critics it must have done the wrong thing. Eric Fischl's "Tumbling Woman," at Rockefeller Center. Eric Fischl's "Tumbling Woman" sculpture forced millions of Americans to acknowledge they were mythologizing September 11 and evading the the complex challenges and opportunities connected to that event. As a culture, we weren't confronting the realities present before and after. It's still true. 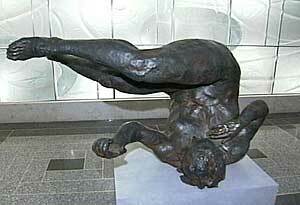 I like some civic sculpture because it challenges the superstitions of a culture, and "Tumbling Woman" does that. In the old days sculpture supported cultural superstition to promote civic control. After September 11, many were too emotional and somehow Fischl was good enough to get people to let off some steam. That steam was then redirected into the artist's face, but hey, it comes with the territory. It might even be a great sculpture, but it's too soon to tell. It flopped publicly, but that is not a death sentence. In fact, if it gets successfully resurrected it will be knighted "great stuff." Which reminds me that art criticism is about sometimes making hasty judgments; art history is about recognizing it as hasty. Still, art history gets stupid when every artist who is worth a lot of green is somehow considered a major player. 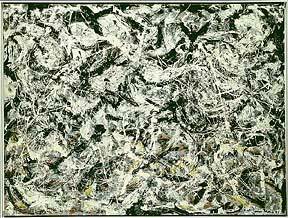 Jackson Pollock's "Greyed Rainbow," at Art Institute of Chicago. For the record: Everything I see affects me in differing degrees, but only a few things absolutely floor me  Caravaggio's "John the Baptist" and Jackson Pollock's "Greyed Rainbow" (possibly his last top-shelf work) being two examples of flooring. The big P and C knew about life and death and their great intensity and thoroughness make people like Thomas Hirschhorn or Jessica Stockholder look cute. Greatness involves changing the way we approach a subject, not merely commenting on existing phenomena. Stockholder and Hirschhorn are good, but not in league with P and C's stronger engagement with history (they sought to redirect history, not just comment on it). If you prefer the vibe of the minor leagues, well, that's fine, too. I just prefer ideas, meanings and presences bigger than myself, not smaller. A romantic notion? Yes, but where would we be without ambition as a force of change? Here's my take: The art-making enterprise of the last 30 years has produced a greater abundance of "good" art than any other era of human history. That, of course, is a backhanded compliment, since I've seen less Great Art produced during that same era. 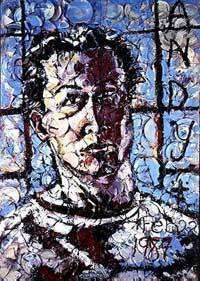 Julian Schnabel's "Self Portrait in Andy's Shadow." Why? There has been a great leveling  not in terms of class, but in terms of accessibility. With thousands of contemporary art centers and art schools, it has had the effect of expanding Major League Baseball … pitching gets diluted and hitting gets inflated (see Julian Schnabel). The leveling effect: most people simply expect everything to be self-evident and the practice of making distinctions, definitions or applying a general critical eye toward what they see has atrophied. The bar has been lowered to collective experience instead of individual distinction. Be it the institutional art circuit or the DIY art scene, if the collective is just seeking safety in numbers and rehearsed obscurity, it doesn't matter except as a social herding event. A demographer or existentialist writer gets more mileage from this kind of art than the scenesters do if statements are non-existent. Many art writers like lazy artists, whereas serious guys like Barnett Newman (whose letters to the editor are hilarious) and Damien Hirst kind of flog the press, keeping them on the run. Considering that a typical 1845 London street urchin had more wit than 99 percent of the American upper-middle class (who make up the bulk of influential curators, artists and critics), one can see where the problemo lies: acuity. For example, Barnett Newman could run circles around Brigit Riley for rigor, conviction and acuity regarding aims, intentions and effects. It shows in the visual record, although I like Riley … she's pretty good. But great? Nah! 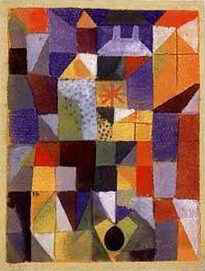 Being pretty good is still an achievement, but to make a point, the great Paul Klee, Riley's favorite artist, blows her away. So, who is great from the last 30 years? Richard Serra, Damien Hirst, Basquiat, Gordon Matta-Clark, Ellsworth Kelly, James Turrell, Joseph Beuys, a few Gerhard Richters, a few Anselm Kiefers, Andreas Gursky, Richard Long, Ed Ruscha. I'm being generous and the list could easily become Beuys, Kelly, Hirst, Turrell and Basquiat. Those five will hold up and no installation artist has really shown to be of Beuys' caliber for truth in chicanery. Turrell gets points for turning outmoded Mayan science into the sublime. 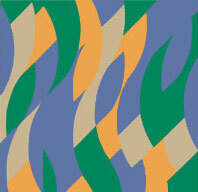 Bridget Riley's "Reve": no Klee! Art can be mischief, but it's better when it is grand mischief, since a culture that supports and allows grand mischief is stronger than one that simply tells art-party jokes. Think of all art forms as the weights for a civilization going to cultural gym. After training, the culture is in a greater state of readiness for the inevitable challenges that continue to pop up. Video art has yet to get beyond good in my book, because it lacks the threat element I find necessary  and it still feels like second-hand smoke. The distance factor inherent in the medium is a handicap for me. The only recent artists I consider to have potential to join the greatness ranks are Cornelia Parker (Beuys & Louise Bourgeois' heir? ), Takashi Murakami, Karin Davie (who, through freshness, cleans up the messy dead ends that Greenberg left abstraction with) and Rachel Harrison, whose solo show at the Milwaukee Art Museum left me filled with awe and a sense of discovery. 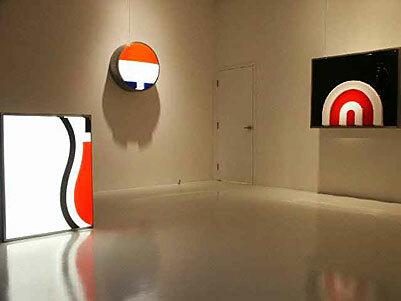 Harrison was launched by Lawrence Rinder in the wide-netted but diffuse 2002 Whitney Biennial. A growing consensus, though, whispers that she alone may redeem it. Her work is complex, like a strange dream about contemporary art, and really makes Hirschhorn look affected. Harrison's work is informal and a fresh/grotesque graft of sculpture and photography. With "Cargo," she perches found Hollywood images atop a gloopy yellow ball. She perfects things John Baldessari championed, like juxtaposition without all the arch-impersonal cuteness. Instead, it is an uncomfortable oddness juxtaposed with the familiar. "Cargo" is special because of how direct it is; extended narratives die quick, funny deaths in its sphinx-like presence. Great art typically out-maneuvers its describers. 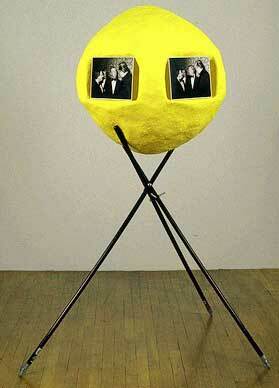 She's got a kind of Robert Gober sculptural mischief combined with Baldessari's image play. Still, Baldessari's career has an amazing consistency Harrison may not be able to compete with. 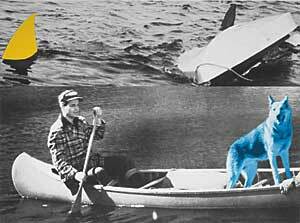 John Baldessari's "Man, Dog (Blue), Canoe/shark fins," at Elizabeth Leach Gallery. Harrison's traditional photographs are strictly average; drop 'em. Thus, great art is very rare compared to the previous 30 years, when we still had Paul Klee, Duchamp, Pollock, Mondrian, De Kooning, Warhol, Barnett Newman, Rothko, Picasso, Matisse, Giacometti, Joan Miro, Joseph Cornell, Kandinsky, Andrew Wyeth, Clifford Still, Alexander Calder, Eva Hesse, Ed Ruscha (again), Beuys (again), Robert Rauschenberg, Jasper Johns and Roy Lichtenstein. I can't cut any of these in good conscience. Savage really showed how it's done this month, with Su-en Wong and Heidi Cody. Why? Because Wong and Cody are quite good (but still not great). Wong's new work was a significant upgrade from her previous Savage outing. Why? Because the work more fully realizes her aims. Her work, with its endless array of lil' Asian girls (the artist herself) in naughty-but-nice poses, explores the tenuous definitions of identity, gender and social roles. Her last show relied more on the figures themselves and less on the theatrical staging apparent in this show. This is important because the designer colors, for example, in "Gentlemen's Grey," add context, but in a somewhat absurd way since lots of nubile Wongs are splayed out on a tiger skin. It's a typical gentleman fantasy, both silly and ecologically irresponsible with its tiger skin rug. The whole scene is tenuous, like Wong meeting a strange businessman on a bus and being able to see his thoughts. Of course, the best work is "Warm Comfort"  a commentary on the subjective nature of judgments, including the kinds I have been making. Subjectivity is powerful, though, and Wong answers with subjectivity of her own. 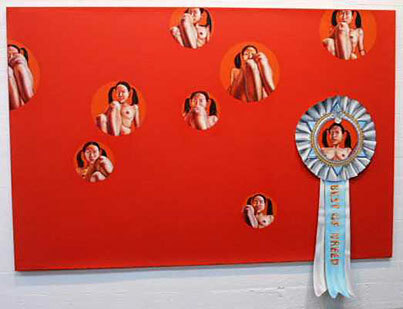 Although the blue ribbon is mostly sarcastic, this work outdoes the others by declaring itself the best. It has this fragile-looking blue ribbon affixed to it … and, as an indictment and celebration of subjectivity, it dares the viewer more. All the works are colored pencil on large-scale paper, but this one flaunts that fragility and tenuousness through the corny and dead-on confrontation of the ribbon. The colors, vermillion and satin blue, are strong, too. Cody is a good artist who has potential to be great. Why might Cody be extra special? Her show at Savage went past the gimmicky-but-good alphabet series shown at PNCA's Feldman Gallery last year and showed extensive growth. Here's hoping she keeps this up: subject matter is key in stepping up. This time out she touched upon big oil, the fuel on which Western Civilization runs. Her light boxes in the front room are taken from signage of Conoco, Phillips and other oil companies that are all to merge into one mega-company. What is special is not her interesting practice of zeroing in on part of a company logo ... it's her focus on volumes as they relate to the logo. On every piece, the logo has exaggerated three-dimensionality, giving each a subtle but palpable intrusive heft. This is oil, not some flat-branded celebrity like Warhol … this isn't 15 minutes of fame, this is 100-plus years of economic dominance. Who is she to measure big oil? This issue of measurement is where Cody shines … each piece is built to scale in reaction to the market-appraised worth of the company's stock. Thus, Conoco and Phillips-66 light boxes are bigger than the other merging companies. This is the stuff, and it relates to The Enlightenment. The Enlightenment, with Descartes, Isaac Newton and Thomas Jefferson, was an era when everything was measured. By that, constant criticism was achieved and things were held accountable. In terms of the U.S. Constitution, checks and balances were achieved, since no one strategy of government could be held accountable to measure itself critically. Today, these big corporations are seldom measured and their combinations usurp any checks and balances. 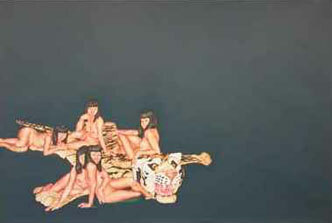 By framing the tyger's fearful symmetry, Cody dares something and goes beyond the typical gallery experience. I call it Pop Enlightenment. Still, it needs to go further, in that the show could have been called "Big Oil." 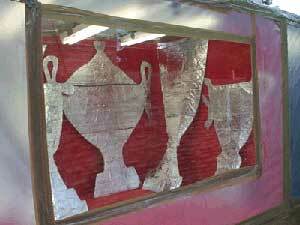 Also, the merger installation should have been made more apparent in her statement and gallery hang. The other oil signs on the long wall seemed superfluous and lacked the inherent threat of the merger installation. In other words, Cody needs to work on contextualizing and sharpening her sword if she is going to draw it. It reminds me of my first job in Portland, where a big oil company applied for a hefty line of credit with my firm. I ran a check and, based on their absolutely horrendous inability to pay (way beyond 90 days, bleeding the firm dry), realized they weren't worth the risk. I denied them. Heidi Cody, you have an ocean of talent, but there are even bigger fish than big oil.